The Law Office of Richard Weaver has been practicing criminal law in Collin County, Texas and surrounding counties since 1977. 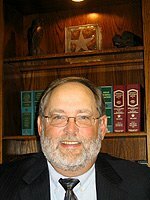 In 1988, he became board certified in criminal law by the Texas Board of Legal Specialization. During that time, the vast majority of his practice has been dedicated to protecting the rights of the "citizen accused." In today's times, it takes an experienced criminal trial attorney to protect those rights guaranteed to us by our constitution.